Vasileios Lampropoulos has graduated as Naval Architect and Marine Engineer from National Technical University of Athens. Has been engaged in various European research projects during his academic period and while preparing his PhD. 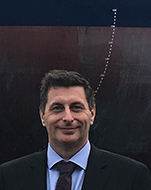 In 2000 joined Thenamaris Ships Management as Technical Superintendent, has supervised the construction of ten vessels as Site Office Manager in Korea and since then has served as Technical Manager, Chief Technical Officer and currently as Chief Operating Officer supervising a fleet of 82 vessels (78 in operation and 4 under construction).